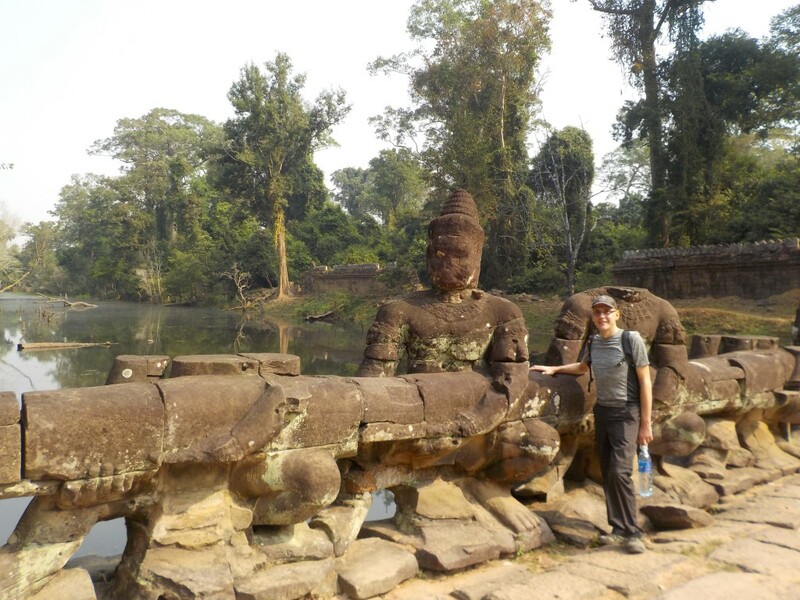 Asia 2016: Siem Reap – Do your dream! This trip is slightly different to our previous Asia trip as my parents should have been joining us for the first 4 weeks (see later). As they are (cough) 70+ we’ve had to take that into consideration in terms of locations and timings, with the most annoying fact in that we need to plan and pre book things to make sure it works for them. Apart from that not much else is changed. We did get them to fly out a few days before to adjust to the time zone and climate, but sadly all that happened is my poor mother got a dodgy stomach and when we arrived could barely leave the room. Oops. The flight over was fine, Heathrow to Ho Chi Minh and a simple transfer to Siem Reap. Visa on arrival was quick and painless $30 and passport photo we prepared and then simple tuk tuk pick up by the guesthouse we used last time. Within minutes felt back at home again here. 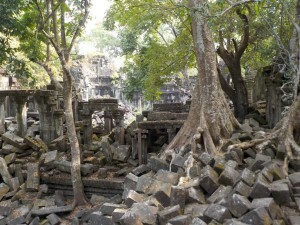 Cambodia has lost none of it charm or friendliness or adventure. 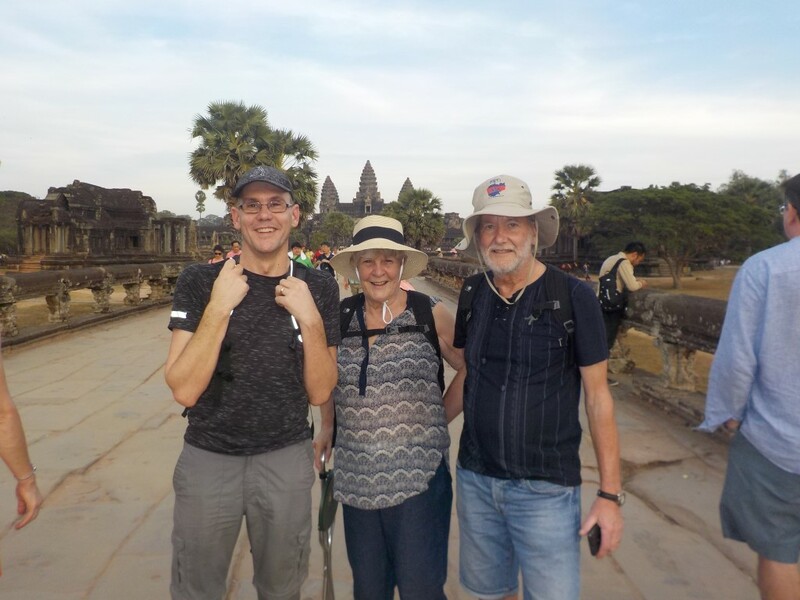 After meeting the parents and a nap we ventured into Angkor to watch the sunset over Angkor Wat and dragged the parents along. They did go a couple of nights previously and it rained. We arrive and its sunny. 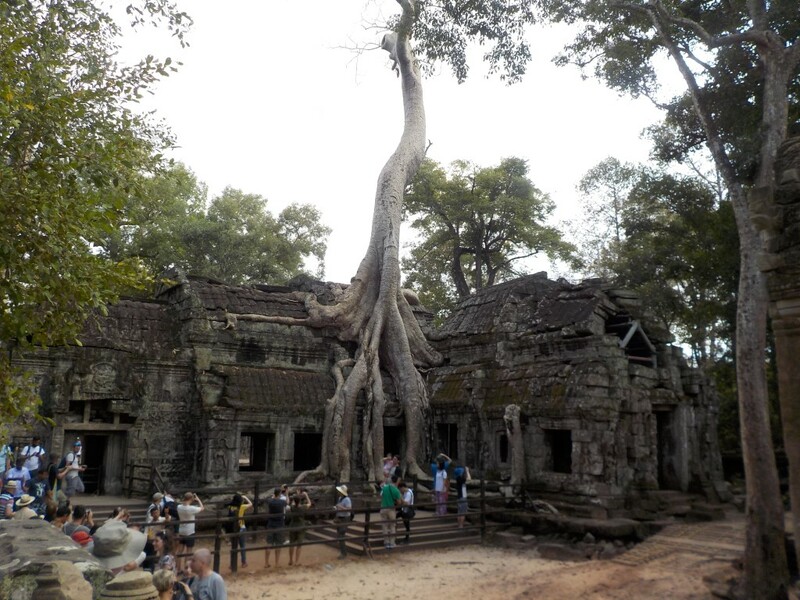 We have seen very little rain in Cambodia – hope their luck improves! My mother was out of action with a stomach bug so we took dad out into town for beers and tea. That was the plan, but in the heat and humidity he wasn’t well (slight understatement in case mum reads this) and we had to get him back to the hotel. Further info determined it was likely to be dehydration and heat related so we now need to enforce their bottle water intake. It is amazing how much fluid you sweat out… So top tip: drink lots (2L+ water per day) and make sure clothes are technical wicking type – not thick ones! Anyway, we headed back in for a lovely noodle tea at a street café for under £1 each. Lovely. 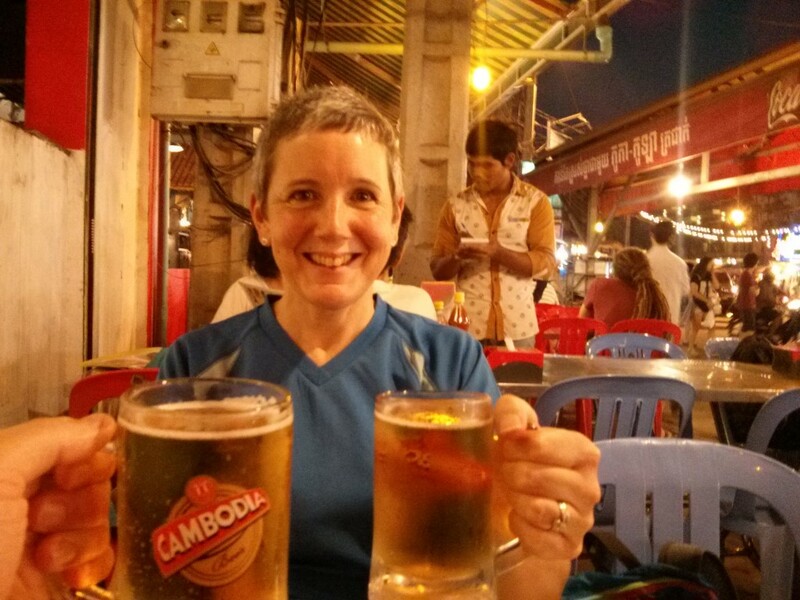 Siem Reap seems to have become a lot more party/drinking orientated – more khao san road than true Cambodia – a lot has changed in the nightlife and not for the best. Too many grey westerners with pretty locals, and tuk tuks offering weed as well as transport. Not great but is still safe and not totally ruined, Yet…. Though after a late night we did sleep in till 9:55 and only just had breakfast, and then Mel fell asleep till 12! Such party animals! But every once in a while you need a lazy day to do laundry (as in pay $1 per kg for someone to do it) and just randomly explore. After our rest day we took a days cooking course. My parents were better but not 100% but did the morning course. 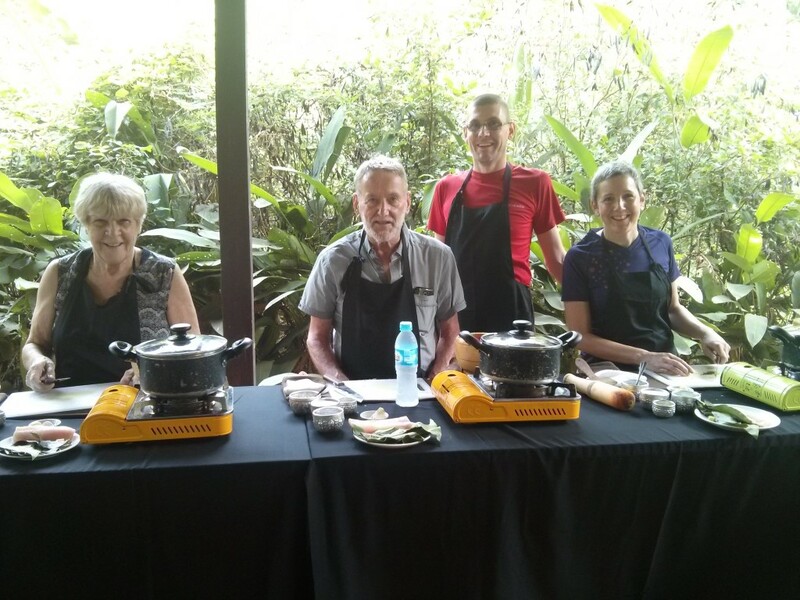 It was run by Unique experience which appears to be an ethical company andso the course and village tour was well run. 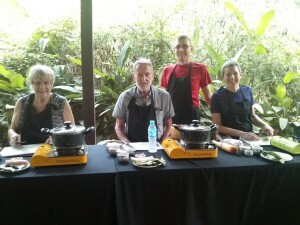 After cooking and eating 2 3-course meals we were a bit stuffed! Its amazing even with this blog diary how much we’ve forgotten. We did a tuktuk “grand tour” of some temples which we’d seen before but forgotten and were wowed again. 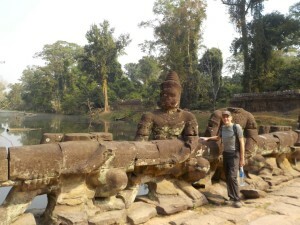 Pre Rup and Ta Som were just stunning, with East Mebon being good and others a bit meh. Overall though, superb. Buying water and coconuts was a pleasure with no stupid attempts to fleece use and just happy ladies selling. Nice! 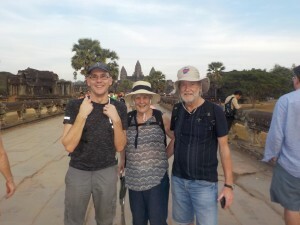 With the parents seemingly OK we took them on a long tuktuk ride to tour the Rolous group and Beng Mealea – the latter having the look and feel of an undiscovered and unrestored temple and well worth the visit. 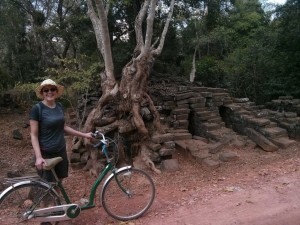 The route through the villages gave the parents the first view of real rural Cambodia. Sadly, dad suffered again and was quite unwell in the heat. This warranted a doctors visit and for him to get put on a drip for fluids and tested, but it appears he can’t cope with the heat and humidity any more. Good job they have insurance as the doctors fees were definitely tourist prices!!! The downside is the rest of their planned trip is mainly outside visits which dad can’t safely do – if the heat issues cross into sunstroke then things get serious and help won’t always be near. So reluctantly we all agree they need to abort and get back to the UK safely which will sadly be direct from Bangkok. Keeping him locked in air conditioned hotel rooms isn’t really fair! So need to amend their plans and get them to safety. 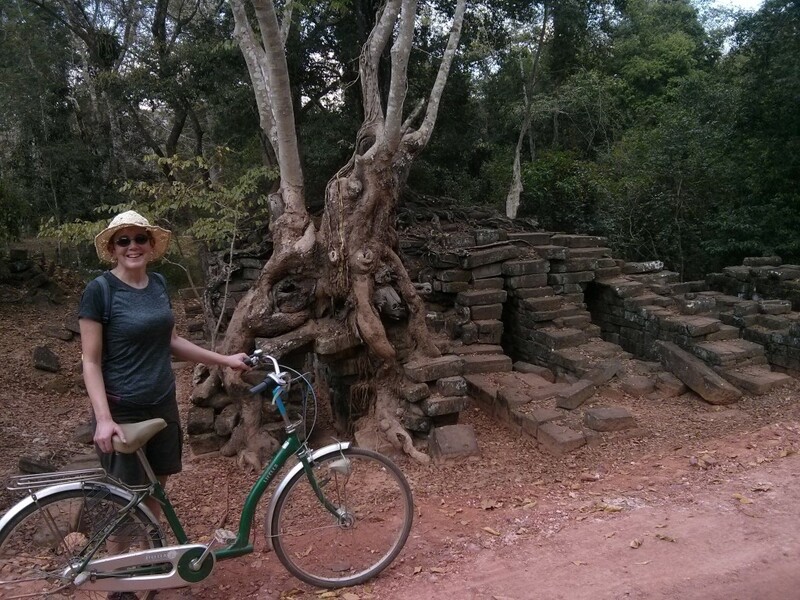 Our last day Mel volunteered to help out a lady looking after animals at a cat pagoda – can’t keep her away from work! She loved it and did what she could and gave the kitties some Whiskas. 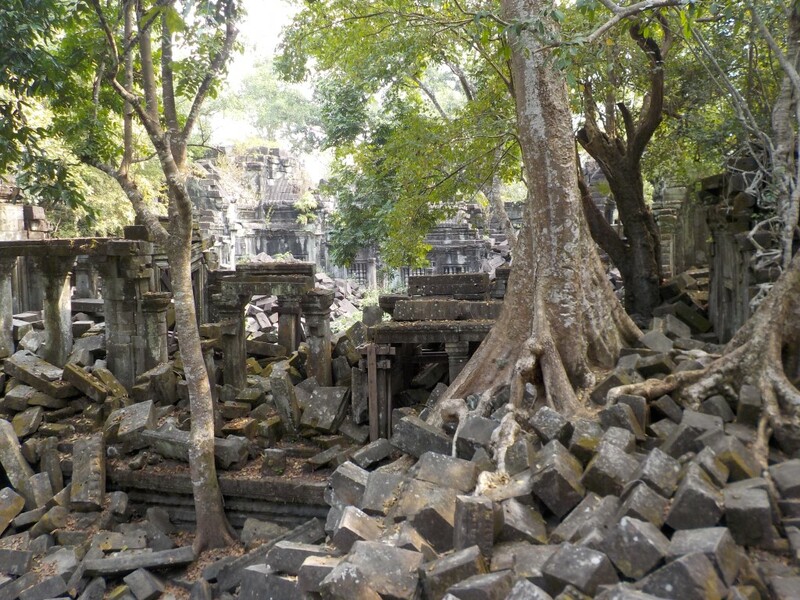 So Cambodia has lost none of its marvel. If you fancy it do it asap as its getting more popular all the time. Wish we could’ve done more and we’d happily stay longer and visit other places. Glad the parents saw it, just a shame the heat was too much. But we hope they had a memorable trip for the right reasons!! ← 2016, 2017 and 2018 adventure plans…..